The human race is a competitive one, to say the least. We became the dominant species on the planet then built weapons to ensure our place as top dog among the rest of the predators. After that, we started competing against one another to see which individuals are the best at each feat of strength, speed, endurance, and in various forms of athleticism. 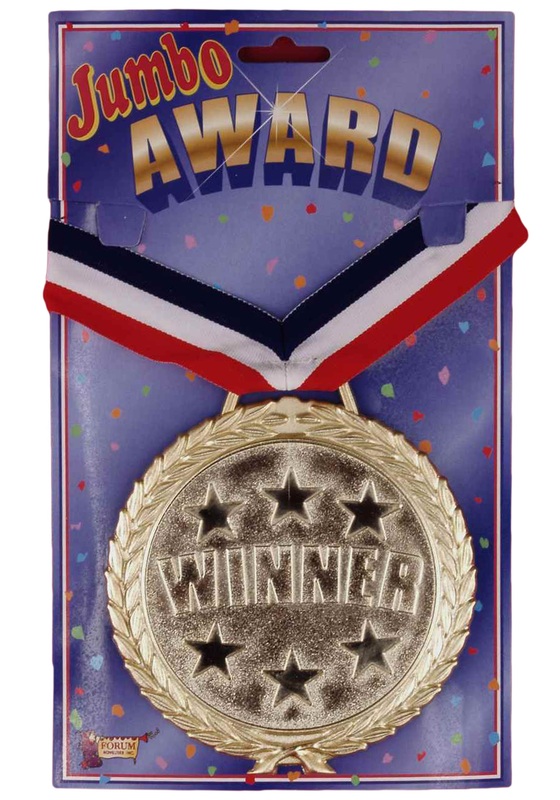 To honor the best of the best they are rewarded with a keepsake as memorabilia, some sort of souvenir to take home. Some have trophies, others have belts, but the coolest item awarded to victors is hands down the Gold Medal! It's not as tacky as an oversized belt and it's way more convenient to carry around than an awkward trophy. You will look like the humble champion that everyone knows and loves. When others ask how you earned this medallion say whatever Olympic game you'd like and then do a quick back flip and there won't be any more questions. Everyone believes the person doing backflips! So work on that backflip, grab a red, white and blue jogging suit and throw on this Olympic Gold Medal for Halloween this year!